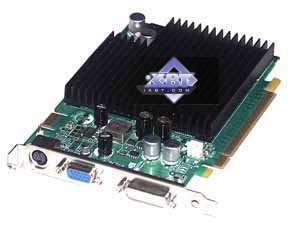 This GPU is presented by reference card NVIDIA GeForce 7600GS 256MB GDDR2 (400/800 MHz) PCI-Express. 256MB GDDR2 in BGA chips. 400 (800) MHz clock rate. Peak fill rate in the multitexturing mode without optimizations is 4800 megapixels/sec and 4800 megatexels/sec. By the end of the month the product costs about $90-140. This Lower Middle-End graphics card supports DirectX 9.0c, including Shaders 3.0.